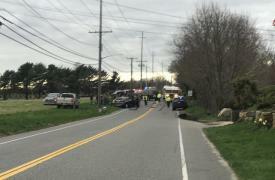 A serious crash had Sound Avenue closed to traffic in both directions for three hours today between Phillips Lane and West Lane in Aquebogue. 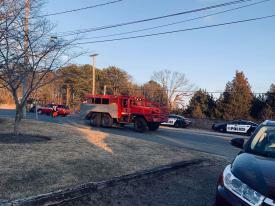 A car and a landscaping truck collided head-on on Sound Avenue at about 4:05 p.m. 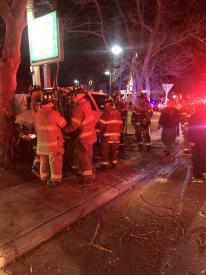 The operator of one vehicle was transported by Riverhead Volunteer Ambulance Corps to Peconic Bay Medical Center. Fire consumed a detached garage at a house on Marcy Avenue yesterday evening. Riverhead Fire Department was called to the scene of a working fire on Marcy Avenue shortly before 5 p.m. 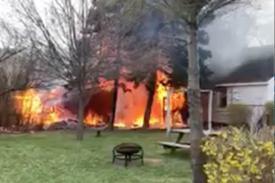 They found a detached frame garage almost fully engulfed in flames, according to reports. The fire did some damage to a garage on an adjoining property on Sweezy Avenue, according to reports. Riverhead Fire Department made a quick stop of a brush fire that broke out just south of the railroad tracks off Hubbard Avenue Tuesday evening, near Shade Tree Lane. 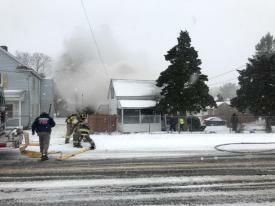 Structure fire at Hamilton Ave.
Three people were injured in a house fire on Hamilton Avenue this afternoon. Two occupants of the home were transported to Peconic Bay Medical Center for treatment of minor injuries and a firefighter was treated at the scene. The house at 475 Hamilton Avenue was severely damaged.